Best Western Port Clinton est idéalement situé dans le centre de Port Clinton. Venez découvrir et profiter de notre hôtel à côté des principaux sites touristiques. Réservation au meilleur prix et offres exclusives toute l'année. Chambre avec deux lits doubles. Port Clinton offre d’innombrables occasions de s’amuser et de se détendre. Activités estivales du l'île du lac Erie. Parcs nationaux, canotage, pêche, scooter des mers, plages, visite des îles Kelleys, Put-In-Bay et Middle Bass. Observation des oiseaux au printemps, festival Walleye, pêche sous la glace en hiver. 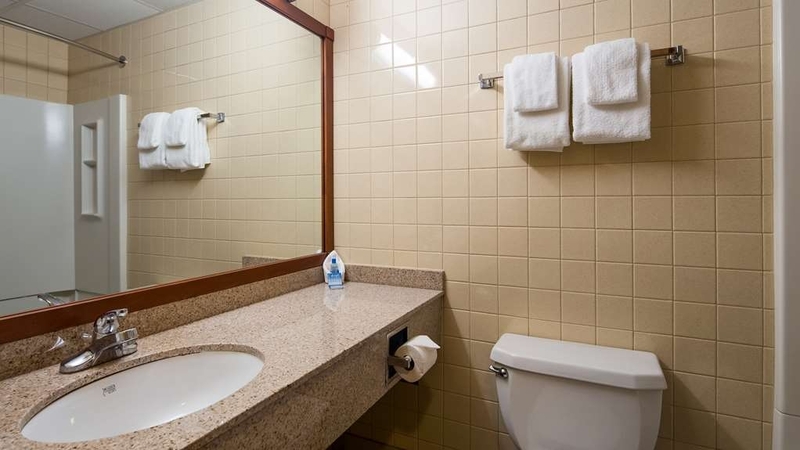 Situé à seulement 200 mètres de la plage, cet hôtel Best Western tout confort de l'Ohio vous offre repos et détente. Explorez la région, découvrez les îles du lac Erie, l'île de Middle Bass et l'île de South Bass. Deux parcs nationaux se trouvent également à moins de trois kilomètres de notre hôtel. Les nombreux espaces de loisirs à proximité vous permettent de pratiquer la pêche, la randonnée et l'observation des oiseaux pendant votre séjour. Envie de pimenter votre séjour avec un peu d'aventure et d'adrénaline ? 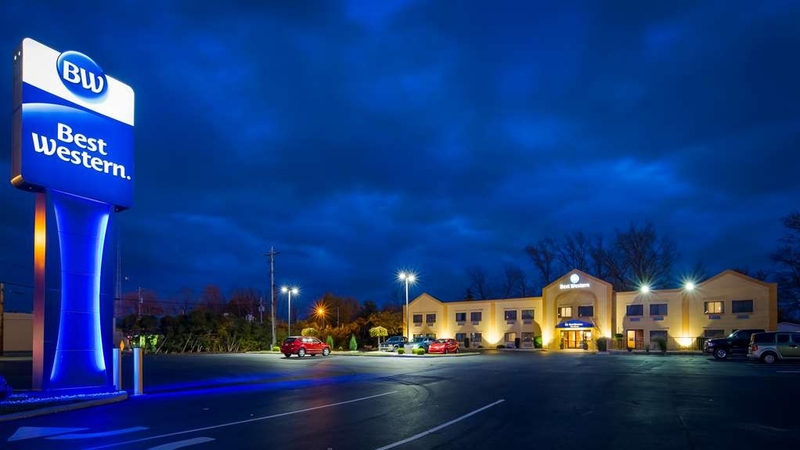 Le parc d'attractions de Cedar Point, le zoo de Toledo et la réserve d'animaux de l'African Safari Wildlife Park sont tous à moins d'une heure de route du Best Western Port Clinton. Rien de plus facile que de vous restaurer : l'hôtel offre un accès pratique à des restaurants et salons proposant une cuisine savoureuse. Quatre restaurants sont situés à proximité, dont deux à seulement quelques minutes à pied. Les voyageurs d'affaires pourront tirer parti de la situation privilégiée de l'hôtel, proche de la centrale nucléaire de Davis-Besse, de Camp Perry, du Jet Express et du ferry Miller Boat Line. Voyagez en toute simplicité : l'aéroport de Toledo est à seulement 56 kilomètres. Nos chambres impeccables et reposantes offrent toutes télévision neuve haute définition avec chaînes câblées ou par satellite et HBO®, cafetière pour une tasse, accès gratuit à Internet haut débit, réfrigérateur, four à micro-ondes, coffre-fort dans la chambre et bien plus encore. Chaque séjour donne également droit à un petit déjeuner gratuit avec gaufres belges à faire soi-même. Après une journée de travail ou de tourisme dans les environs, vous pourrez vous détendre dans la piscine extérieure ou vous promener sur la plage de cet hôtel de Port Clinton, qui admet les animaux. En outre, nous mettons à votre disposition une blanchisserie réservée aux clients de l'hôtel, un parking gratuit et un centre d'affaires avec une réception ouverte 24 heures sur 24. Pour un séjour mémorable et amusant à Port Clinton, réservez une chambre au Best Western Port Clinton dès aujourd'hui et faites des économies ! "We will be back! Most amazing stay!!" Our room was amazing! Staff was extremely friendly! Breakfast was better then most restaurants! Art on the walls were real photos instead of cheesy hotel art! Room was super clean and fresh smelling! Staff always welcomed you when you walked in! Such a great experience!!! This Best Western is in dire needs of repairs ! Needs updated bad ! Plumbing in the bathroom and bathtub need replaced immediately ! An extension cord was hanging from the hallway ceiling going into a room ! Curtains and rods were broken in the room ! Also a musty smell ! "Room Stay at Port Clinton"
Check in was great, room available. Asked for directions for dinner, prompt response. When we got back, we were greeted with a welcome back. The bed was made in such a way that we did not overheat. Only thing that could have been better was that housekeeping staff were at the door ready to clean room, two hours before check out. Explained to us and other guests that we were apparently already checked out. We were so tired from previous days activities, but checked out about an hour early as we felt we were keeping them from their job. "Friendly Staff & Three double beds"
This is the first hotel that I've found that has three double beds in one room. The room was clean, the beds were comfy, AC was cold, and the staff was very friendly, especially the woman who was restocking the food in the breakfast room. I would stay there again. The hotel carpets, fixtures, and paint need updating. There was a bad smell in our room so we purchased fresheners. The baseboard fell from the wall outside our room as we opened the door and the bathroom and bedroom had spider webs and hair. The bathroom sink kept backing up also. "Spiders in the room; moldy muffins"
There a multitude of spiders in our room to the point we needed to exchange rooms. I get we are at the lake and there are spiders, but in a room we are paying for cleanliness. Then our last morning I grabbed a plastic wrapped muffin and it was all moldy! Do not stay here. "Good value for a pet room"
Booked night before arrival. AAA rate $81 total. Glad to have our pup with us. Room clean. 1st floor room 102. Noise from pool very loud but done by 10pm. No bugs at all. Did notice slight musty smell in morning after 2 people showered. Did not see leaking ceilings but didn't go to 2nd floor. Breakfast was fine for a motel. Make your own waffles and pancakes. Eggs, sausage, potatoes. Yogurt, cereals, breads, pastries, juice. Very busy for a Monday morning but only saw sausage run out. Adequate supplies till 10 am. Staff at check-in and through stay were friendly and polite. Check-out also very nice. Would stay again with our pup! If I could rate this “hotel” a ZERO, I definitely would. We booked through a third party. 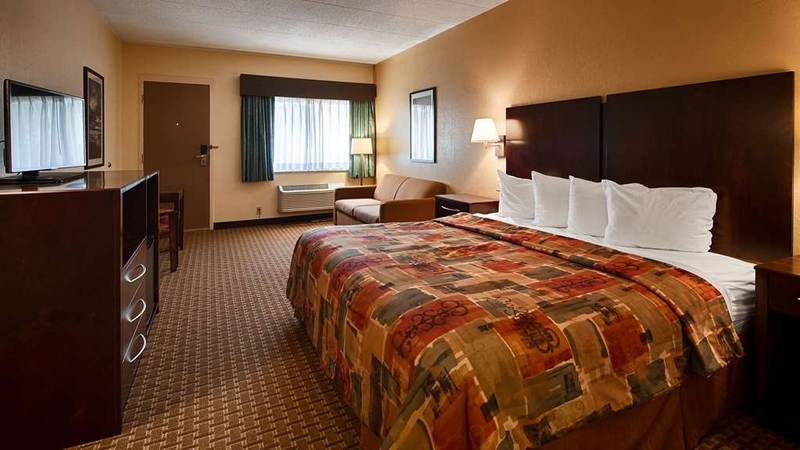 Best Western is always our first choice when looking for accommodations. The lobby was clean. As soon as we headed up the stairs to our room, the temperature rose drastically and there was a very distinct smell. Once we were to our hallway, there were two trash bins catching the water leaking from an open ceiling. As soon as we got into our room, we noticed the unpleasant musty smell. In a matter of 5 minutes, we had to catch a few giant crickets & put them outside. When we returned that evening, we were relaxing in bed. Our small child was attempting to fall asleep in the other bed. My boyfriend noticed bites on his arm. After that we switched rooms. The next morning my child was covered in bites. We proceeded to breakfast, and I found a hair in my food. I have never experienced anything like this. Please beware when booking a room at this hotel. Don't let the “Good Reviews” fool you. "Are you sure this is a Best Western?" I chose this BW in Port Clinton because I thought we'd be safe staying with a reliable chain. That didn't turn out quite like I'd hoped. The hotel is very small and quite worn in places. The room was clean but the beds felt ancient and creaked through the night. The clerk at check in seemed less than enthusiastic to be there, but she was high-energy compared to the one we encountered this morning. The first odd thing is there's no elevator. So we had to lug our suitcases up a long, narrow, dark and dirty stairway. Then the ceiling in the hallway upstairs was water damaged and falling in. We were tired enough that we made the best of it, but it was definitely not worth what we paid. It felt like a $45/night type of place you'd find off an interstate. Breakfast was horrible—burnt egg-like discs stuck to the bottom of a warmer, tiny cups, no plates, no milk, and barely anything to be found. We've stayed at a lot of BW's and always were pleased. This can't possibly be part of that chain, can it? Definitely not up to standard for the franchise. "Carbon monoxide detectors battery needed changed, everyones across the hotel went off all night long"
Room was clean, sink was clogged when we arrived but they sent someone up and fixed it while we were out. Pool, breakfast great (my husband raved about it), only thing was in the middle of the night we hear a beeping alarm sound from another room, then another and then our carbon-monoxide detector starts going off. I wake and grab my sleeping kids, my husband calls down to the front desk while I'm headed toward the door of our room, when he says that all the detectors batteries are changed at the same time and all are failing and need changed across the hotel. Lots of beeps from other rooms all night. So they say they'll replace it in the morning, right, I'm like sure let's just 'trust' that we won't have any carbon monoxide risks. So my husband goes down to the desk to ask for a battery so he can replace it himself, they don't have any so back to the room he comes. Worst night of sleep ever! In the morning the breakfast was great, but at checkout no one apologized for the horrible night. As long as the detector batteries have been maintained this hotel is great, otherwise yeah, not amazing! My husband and I and my three children came for a visit to Cedar Point with my sister and brother also coming in to get together. The staff were warm and welcoming. We stayed for three nights. The second night we returned to no bath towels replaced. But the housekeeping staff made sure we had plenty the next day and they even wrote a note to apologize. The room was clean and very spacious. There is no elevator but only ten stairs to go up. The pool is open later so that you can go to a late dinner and still come back to relax with a swim. My only complaint would be newer mattresses as they were very springy and a bit uncomfortable. But overall the price was fantastic and the location was great and we will stay here again. The hotel had better service this year, staff was better. This is the best place to stay for the money in Port Clinton, other places cheaper are not as nice and nicer places are a lot more expensive, dont expect luxury but the rooms are clean and so is the hotel. "One night stay, wouldn't go back again"
The good: staff was friendly, the breakfast was good, the room was ok, but also the room had many cobwebs and some spiders on the ceiling. It was one of the noisiest rooms we have ever been in. We could easily hear doors open, people talking and easily hear the train whistles every hour or so. Our sleep was broken up several times. "Overcharged And Took Item From Our Room"
Hotel overcharged us from our reservation price and when informed of this still overcharged us. Hotel staff took a valuable item out of our room and management did nothing about it. Manager had poor attitude and lied, One of the front desk staff also had a poor attitude. Overall terrible experience. "Epitome of what you expect convenient to basically all of Port Clinton"
You get what you pay for, and that's a good thing here. Decent price I felt, and good location for doing anything around Port Clinton which is why I booked. Rooms were nice, clean, and breakfast included was definitely on the smaller side in options, space, and the like. But I wasn't expected a ton, so like the hotel it fit with our needs. I will add that its basically just across the street or so from the main public beach which is itself directly across from a small park that has what I can only call the world's greatest playground. So if you have kids, and time, there is a beach very near and a playground that has EVERYthing to keep younger kids occupied. Park is new and clean as well. Great stay, friendly and knowledgeable staff ?? Very easy check in and out, centrally located to all the area has to offer. Breakfast was great, quiet and calm atmosphere ! I would stay again. Thanks for a great stay. This Best Western looks a little older and is two floors with no elevator. When we checked in the late afternoon we were greeted with a welcoming smile. She was very nice and I wish I had gotten her name but I forgot to look. The room was dated and had a musty smell but when we started the air it went away. The beds weren't too comfortable and the pillow was flat as soon as my head laid on it so I tried doubling but it didn't help. The bathroom was also dated and there was mold inside the faucet handle. One of the towels looked like someone had dried their hands on it. When I asked my family nobody had used it so I wonder if it was leftover from the last room. The doors slam loudly when they close which happened a lot in the rooms next to us because there were kids running in and out and screaming all evening into the night. We went out for breakfast because the one downstairs was very crowded. Parking was good and we didn't struggle to find a place. Lake Erie is across the street and it's a great view. "We recently travelled to the area and the island and needed 3 rooms with at least one being handicap equipped." We stayed at the Port Clinton Best Western the night before a fishing charter. 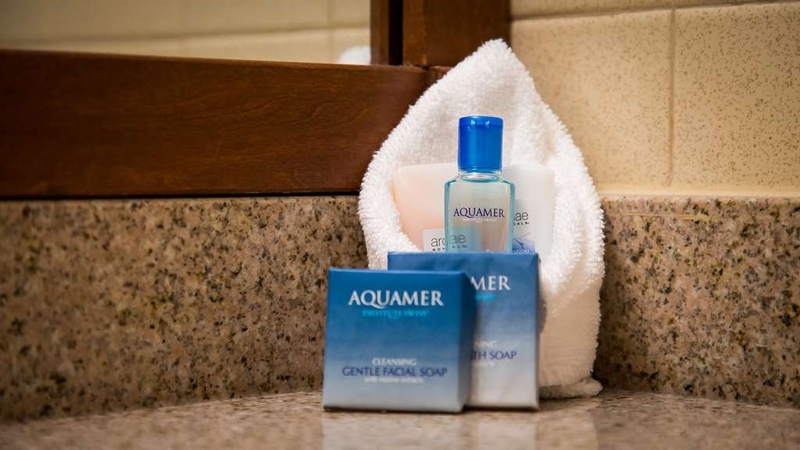 The rooms were clean and the staff friendly and courteous. We arrived late and left early the next morning and breakfast was prepared and waiting. Although a very short stay we were totally satisfied. "Don't Stay Here - Plenty of Good Options"
If you're going on a fishing charter, do NOT stay here. There are plenty of other options in the area with far superior customer service. For the first time in 5 years, our charter, Daze Off (who I highly recommend), had to cancel for our trip tomorrow due to weather and of course, we needed to cancel our rooms. Ashley, the manager, was argumentative, essentially called us liars and was combative over us simply requesting to cancel the rooms. We certainly understand policies and procedures, but being in business and understanding customer relations, we also understand how to treat people and clients. We've stayed at this marginal at best property every year due to loyalty but because of her shortsightedness, they've lost an entire group of 18+ rooms yearly for life and we'll be taking our business to the plenty of other options around Port Clinton. "Comfortable, clean and great breakfast! Hidden Gem." My family and I decided to go to Ceder Point for the Victoria day weekend. Seeing as we live about 4 hours away in London Ontario we decided to stay for a couple nights so we could maximize our time in the park. I should mention we have stayed here before and had a positive stay last time as well. The rooms are clean and comfortable. The breakfast is fantastic. Even for my son who has a peanut allergy and my wife who is picky. The staff on the front desk and the person attending the breakfast were both great. Very helpful and accommodating. Since the last time we stayed 2 years ago they have clearly done some renovations. The lobby area and rooms have been updated. The only negative thing was that our in room safe wasn't working. We reported this to the person at the front desk and they were quick to move us to a room with a working safe. We needed a safe for our passports and other items of value while we were away. 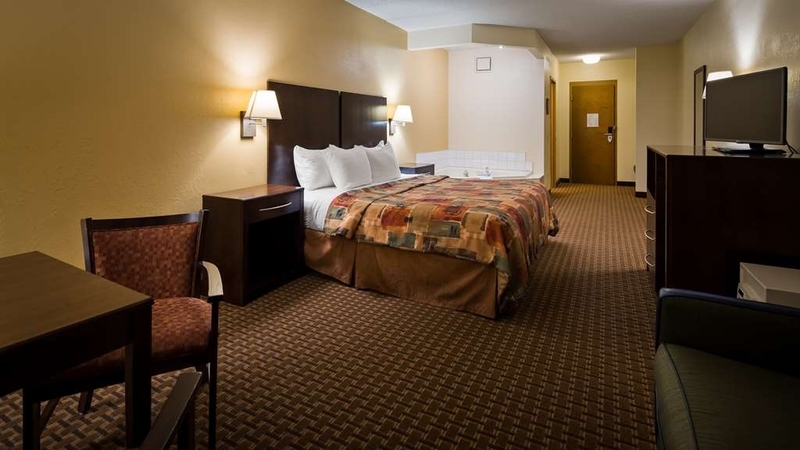 We would gladly stay here again and at about half the price of the Best Western Sandusky. This is truly a hidden gem for any visitors to Cedar Point. I like the hotel. It's easy to get to many of the birding hot spots from there. I like the refrigerator and microwave in the room. That cut down on food costs, because I didn't have to eat out every day. The staff was very friendly. The three bed room was roomy. Breakfast standard. There is no elevator in this two floor motel. Beds are comfortable. The motel is Quiet, and Safe and clean. Lake just across the street. Birded at Ottawa NWR. There were other birders staying here. "Spring Means Walleye on Lake Erie"
Stayed at the Best Western Port Clinton on a recent trip to Lake Erie to fish for Walleye. The hotel itself was an updated version of the old Best Westerns and I was pleasantly surprised.. Relatively small in size but well maintained and efficient, it was quite satisfactory for our overnight stay. The room was clean and nice with no complaints at all about the accommodations. On this Friday evening check-in there was one staff member on the front desk which did cause a delay in checking in. It seemed like she was the only one on duty. There was a free morning breakfast, but it didn't start until 6am. For Walleye fishermen, the are at the dock at 6am or before, so we had to forego the free breakfast. That would be my only complaint about this hotel. Other places that serve breakfast in the area are open at 5am to accommodate the fishermen. If Best Western specifically advertised free breakfast starting at 5am during fishing season, I'm sure the extra effort would be rewarded specifically by fisherman who would choose this hotel for their stay. The hotel is located close to the marinas, with a great view of Lqake Erie right across the street.. Stayed here and really enjoyed the room I got. Very clean, very warm and inviting. Bed was great and I loved the pillows. I do have to say that the staff wasn't all that great and at times just downright rude. I wouldn't stop myself from staying here again because I enjoyed the room and price. "Great mattress, and comfy room"
Hotel and room was very clean. Mattresses on beds had been replaced since I stayed here last, and they are a huge improvement. Lobby has lots of places to plug in phone or computer. Large parking lot with free parking. Outdoor pool was closed for the season(we were here in October). Breakfast had a good variety of items, but the wait in line to get breakfast was frustrating. They kept running out of food items, and plates, spoons, etc., and were slow to replace the more popular food items. We walked across the street to view Lake Erie. Overall we were pleased with our stay, and would stay here again. Thank you so much for your comments. I'm glad you enjoyed our updated lobby and mattresses. I do apologize for the wait for our free hot breakfast. I'm glad you were pleased with your stay and we look forward to seeing you in the future! The room was ok it would've been a lot better if the room didn't smell. The bed was a little hard but other than that the room was Ok. 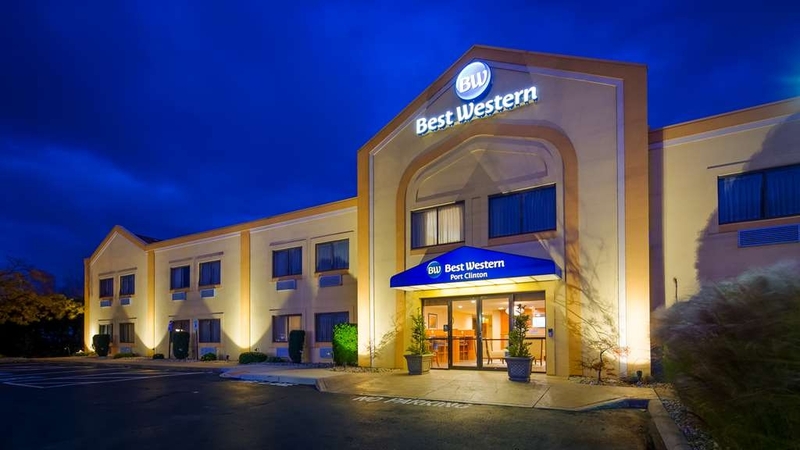 I've stayed at other locations of Best Western and had a better experience. Thank you for addressing your concerns. We appreciate your comments and will use them to improve our property. The motel was in a good location across from Lake Erie close to what Port Clinton has to offer. The rate was reasonable and they graciously redeemed our Rewards points. In season this seems an excellent place to stay. Unfortunately it rained both days we stayed. We stayed one night in this Best Western. The sheets were stained and the night desk clerk replaced them. We stayed at other Best Westerns and never had a problem. Nice guy but we won't stay there again. We came to the hotel in July as a weekend trip for our son's graduation. He loves the area and one of the restaurants and beach. It's not a horrible hotel but not great either. To the staff we give 5 stars! Super nice people! The cleaning and maintenance staff needs some help though. Mayflies everywhere!!! Dead bodies on the room walls, in the light fixtures and window sills. Alive bugs all over the outside of the building and in the pool, which by the way is NOT heated and freezing! I'm sure everyone who lives in the area are used to the flies but not all tourists are! Our room overall wasn't bad but was damp. I would not stay there again. the rooms need updates. Very old place and very small. Check in staff was not friendly or welcoming. Was traveling in area and needed a room for 1 night. should have checked the reviews, but like to stay with Best Western hotels. Do not stay, unless you have no other place to stay! Thank you for staying with us in Port Clinton. We are sorry you did not enjoy your stay. Every year we update something in our Hotel. Two years ago all new furniture was purchased for guest rooms. New carpeting has been installed within the last couple years. New granite countertops have been installed in Bathrooms. Our Breakfast Room and Lobby has been remodeled. I am sorry the desk staff was not friendly. That is not typical of our property. We will advise our staff of your comments. "Great Value in Port Clinton"
We stayed at this dog friendly Best Western for 3 nights over Labor Day weekend. They do not charge extra for the dogs. We were quite pleased to have two entrance doors to our room. One hallway door and one parking lot door. That was so handy for taking our dogs in and out. The room was clean and spacious, plenty of room for 2 adults, 2 big dogs, a big cooler and all our other stuff. Microwave and mini fridge were a great bonus. The breakfast was very good--plenty to choose from. The location is great, you can see Lake Erie across the main road. A small, nice beach is a very short walk with a big family friendly park across the street. Downtown Port Clinton is a few minute drive, where you can take the Jet Express to Put In Bay. Our room smelled slightly smoky, even though it is completely Non-smoking facility. Wasn't a big deal. Overall, we thought it was a great place with very friendly staff. We are happy you enjoyed your stay with us. The rooms with outside entrance doors make it convenient for our guests with dogs. We are glad you enjoyed the breakfast and our convenient location. We hope to see you again. We stayed two nights at this best Western in the evening that we pulled and it was dark and we couldn't even find it because none of the lights were on in the parking lot or at the front of the building. When we checked in and inquired about it the check and you guys said it was behind him and he had no answers for us. The bad quality was very poor and we all slip terribly as the beds were so hard. It was no fitness center which I was greatly disappointed in. Breakfast was OK but not a lot of choices especially gluten free. Overall this would be a decent hotel but for the prices they charge we did not feel we got our moneys worth. If they would upgrade and and replace all the beds I would be a lot more inclined to stay here again . Do not book here. My wife and I went there for our anniversary for the weekend only to walk into the room and walk right back out. The room (210) smelled like cat pee and it still had the previous people's garbage in the can. That makes you think what else didn't they clean. The whole first floor smelled like cigarette smoke even though the hotel is non smoking. The person at the front desk said without hesitation all we can do is refund your money. There was no sincerity or nothing about trying to fix the problem or find a different room. I will never stay at a Best Western again. We are sorry you chose not to stay at our Hotel. I do apologize that my Desk Clerk was not more accomodating. This is not typical of our property. While we do inspect our rooms before a guest checks in I apologize that we missed the items you mention. Housekeeping has been addressed. Thank you. "YOU GOTTA PAY THE BIG BUCKS TO STAY CLOSE"
This hotel has NO value for the amount we paid. While breakfast was nice, the rooms are not. The bed is springy and uncomfortable. The pillows are flat and unsupportive. The air conditioner creaked and hummed all night long. The entrance is inconvenient and the parking lot is too small for all of the guests' cars. Its all about location, location, location. If you want to stay down the street from the Jet Express, this is very convenient. We are sorry you did not enjoy your stay with us. The issues you bring up are not typical of our property. We do appreciate you bringing these items to our attention. I do not know if you let the desk know about these issues while you were in the hotel. We have a 24 hour staff to take care of any issues. Even though, the hotel is not on the lake, you can see the lake. Breakfast is normal with the addition of Cheese omelets and biscuits and gravy. Nice having your own door to the parking lot and a door to the inner hotel. Small pool is outside with easy access to the hotel. Staff is very nice. We are glad you enjoyed your stay with us in Port Cllinton. We hope you will come back and stay with us again. Thank you for your business. If u want a GOOD time, take the Ferry over to Put in Bay and party,party,party.The boat ride is relaxing and the island has bike and golf cart rental's.There are numerous shops and bar's to visit, just take some cash with ya cause you will use it. Thank you for staying with us in Port Clinton. We are 1 mile from the Jet Express. So it is easy to get to Put-in-Bay from our locatation. "Weekend in Port Clinton/Putin Bay"
We stayed at this Best Western for a summer weekend and paid way too much for the quality of the hotel. We ended up there on a Priceline express deal, designating 2.5 stars. I've been to many 2.5 star hotels on business & leisure and will definitely not choose the Best western chain again. The beds were sunken in and uncomfortable, and beyond a slightly updated lobby, one could tell there hasn't been a renovation since the 70s. Overall it felt like the experience of a Red Roof Inn, but had the price of much higher star hotel. We are sorry you did not enjoy your stay with us. I assure you we have renovated since the 70's. Hotel built in late 1980's. In the last 3 years all rooms have been painted. New carpeting installed. New granite countertops have been installed in the bathroom. And, New furniture purchased Winter of 2015. Our rates are competitive with other Hotels in the area. Again I apologize you were unhappy with your stay. "not a very good best western"
We are sorry you were unhappy with your stay. We will use your comments to improve our Hotel. The front desk staff at the hotel was amazing. The only reason they got a poor and not a terrible review. The room smelled like cat pee. We went through two cans of air freshener while we were there and there were bugs squashed all over the walls. GROSS! Thank you for your comments. This is not typical of our property. I hope you went to the front desk if you were not happy with your room. 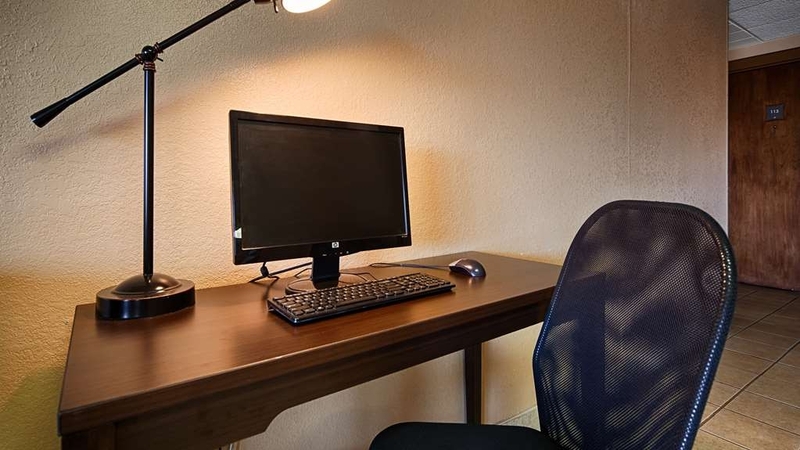 We have a 24 hour desk to take care of any concerns you may have during your stay. I will address these issues with our housekeepers and head housekeeper. Thank you again for your comments. The hotel needs to be updated in the rooms, musty smell, but it is one of the nicer reasonable places to stay, come every year, about the same. We will continue to stay there for the National Matches until something better and as reasonable come along. The rates due jump on the weekends, beware check prices, price almost doubles. Thank you for staying with us in Port Clinton. In the last couple years we have put in new granite countertops in the bathrooms, installed new carpeting and furniture in the rooms is new. We do some updating every off season. Our rates are competitive with the other Hotels in the area. Thank you for your comments. We will use them to improve our property. Thank you for staying with us. We are glad you enjoyed your stay. We hope to see you next Summer. This place is dirty and the employees were dirty. There was a large trash can left in the hallway for the whole first day we were there. There is a trailer park in the back and that is the room view. Ugh. The breakfast was not good. The omelets and boiled eggs were overcooked, the sausage tasted strange and the biscuits were cold. They did not have decaf coffee. Only two fruit choices (red delicious apples and oranges). Adding some grapes or bananas would be wise. It is nice they had Greek yogurt. The room had three double beds which was unique and a nice feature for our large family. Thank you for your comments. This is not typical of our property. I appreciate you letting me know about these issues. We will use your comments to improve our property. Thank you. We stayed here prior to going to Put-In-Bay for a few days. I especially liked the room with 3 full sized beds, as we had three adults in our party. It was a nice sized room, but the TV could have been larger. Breakfast was what you would expect, and we particularly liked the waffle maker. The pool seemed a little small, but we didn't try it out. There is a lot to do in the area. We visited Marblehead Lighthouse, Cheese Haven and the African Animal Safari. Recommend Jolly Rogers right across the street for lunch or dinner. We had dinner there the night of our stay and came back for lunch on return trip. "Fine for a short stay"
The hotel is in a convenient location on Perry Street in Port Clinton. Our room was large and located on the first floor. We were able to park right at the door in the back which was nice. The Wi-Fi worked well as did the T.V. However our overall impression was that there is nothing special about this place. The bed was O.K. but the pillows were lumpy. There was a broken light fixture in our room that I reported the first day we were there. It was not fixed during our three day stay even though I reported it twice. Housekeeping failed to leave more coffee in the room both days and one day they forgot to leave more face cloths. The front desk was happy to give us more when we asked but it should not have been necessary. The breakfast items were not that good and they had no decaf coffee which unfortunately I have to drink. This place is probably fine if you just need a place to crash for a day or two but there are probably better options if you are vacationing in the area. I apologize that you did not enjoy your stay. Thank you for bringing these items to my attention. We will use your comments to improve our property. Thank you for letting me know about the condition of your room. This is not typical of our property. I have instructed our housekeepers to be more careful cleaning the rooms. And, the room inspectors need to correct these items before guest checks in. I apologize for the inconvenience. After a long day at cedar point, the beds were super comfy. Plus they have rooms with 3 beds, no one had to sleep on the floor! Staff was very nice and hot coffee/breakfast in the morning was a bonus. Walked across the street to look at the lake. Thank you for staying with us in Port Clinton. We are glad you enjoyed your stay in our 3 double beds room. These rooms are great for families. "Good value to stay for CMP/JOARC nationals"
Good location, good price, and quiet place to stay with teams for nationals. Rooms are large enough to not feel cramped. Breakfast is actually worthwhile fare instead of typical "continental" garbage found at most hotels. Lunch/dinner options close by and ramp to state highways only a few blocks away. Our team has used this hotel now for three years of CMP/JOARC matches and will be returning next time. Thank you for staying with us during the CMP/JOARC Nationals. We are glad you enjoyed the rooms and breakfast. We look forward to seeing you again next year. Finding a decent hotel near Put-in Bay for a Friday night for less than $200 during the high season/Pirate Fest Weekend can be a bit of a challenge. I admit I chose this property based solely on price and last minute availability since my first choices were either fully booked or marked up to outrageous rates. We knew going in that it was mayfly season. The critters are everywhere and are absolutely unavoidable. No one can fault the hotel for having a few find their way into the lobby. The little beasties made the outdoor pool unusable. Again- no fault of the hotel. Our room on the rear side of the building was quiet. The beds were comfortable. Only shampoo is provided. So bring your own hair conditioner and body lotion. The hair dryer quickly over-heated and stopped working after less than two minutes of use. The AC is adjustable and easy to operate. We liked having both a corridor entrance as well as a back door leading to the rear parking lot. Sadly, the mayfly situation made us keep the rear door tightly closed at all times. Breakfast was typical free mid-range hotel breakfast fare and was quite good. Items included yogurt, waffles, hard-boiled eggs, cheese omelets, sausage & gravy, cereal, juice, fresh fruit, English muffins and various pre-packaged pastries. The layout could use improvement. It was hard to locate the plates and we couldn't find the spoons- assuming there were any to be found. The plates, napkins and utensils were oddly placed all over the serving area. The too-small breakfast area meant placing several tables on both sides of the front lobby. That meant departing guests are trundling through while others are trying to eat breakfast. But there are also a few raised stations with tall stools and electrical outlets available for individuals to plug in their devices and work while having breakfast. There is a computer and a printer in the lobby. That was super helpful since I was able to print out some attraction coupons for the next day spent in Put-in Bay. The internet in our room worked perfectly. There are lots of cable TV stations available along with a helpful printed channel guide for quick reference. All in all- this might not be the best Best Western we've ever stayed at - but it suited our purpose for one night. On less in-demand dates, I'm sure the regular price-point more accurately reflects the hotel's quality. Thank you for staying with us in Port Clinton. We appreciate your comments both positive and negative. We will use those comments to improve our property for guests in the future. We hope to see you again. "Not Impressed with this NOT best Best Western"
Check in was fine, room very unimpressive. Looked sort of thrown together when we walked in. We chose a Best Western because their standards are usually pretty high.. this place definately did not meet them. Continental breakfast was mediocre. There were mayflies EVERYWHERE!!! Minimal effort by staff to clean them out of the lobby and off the front of the building as you walked in. They were literally all over, it was gross. Didn't go into the pool because they were floating all over. Only real positive about this hotel is that it is right across the street from Lake Erie, so you can walk over and see the lake. No, would not stay here again. Thank you for staying with us in Port Clinton. I appreciate your comments. They will help us to improve our property. I am sorry for any inconvenience you experienced during your stay. The bed was very comfortable and I like being able to control the air conditioner levels. We had a room with a king size bed and jacuzzi - everything was neat and clean. Great value for the price and location was very convenient to the Jet Express. The staff was extremely friendly and accommodating. We are glad you enjoyed your stay. Our rates are competitive with the other Hotels in the area. This hotel was basically what you'd expect. I found nothing to be extraordinarily bad or good about it. We were there for a wedding on Kelley's Island, and it was cheaper to stay on the mainland than on the island, which is why we chose this hotel. Staff were very friendly, everything was basically clean, and there was a pool and breakfast. We are glad you enjoyed your stay with us. We hope to see you again. "Hotel policies are not disclosed on website"
We apologize for the misunderstanding regarding children in our Jacuzzi rooms. The hotel public areas were clean. The rooms looked clean until you looked closer, under table crumbs, stained sheets and the worst -- bed bugs. We had a room with 2 double beds - while reading a book one can crawling over the pillow - in the other bed when I got up I found one crawling in the bed. We did trap it and gave it to the person at the desk. They did refund our stay and found a hotel for us for that night. This Best Western has a good view of the Lake Erie, but when we stayed, unfortunately it was very chilly and heavy rains. The staff was very friendly and helpful. The motel is within easy walking distance (in nice weather) of Jolly Rogers good seafood restaurant, and Frisches across the street. We are glad you enjoyed your stay with us. We hope to see you again. Hopefully the weather will be better the next time. Thank you for staying with us in Port Clinton, Ohio. We are glad you had an enjoyable stay. Since we planned to spend three nights here, I checked online for a decent place to stay in Port Clinton. Here are the pluses to staying here...it's close to town and a few of the other places to visit in the area. 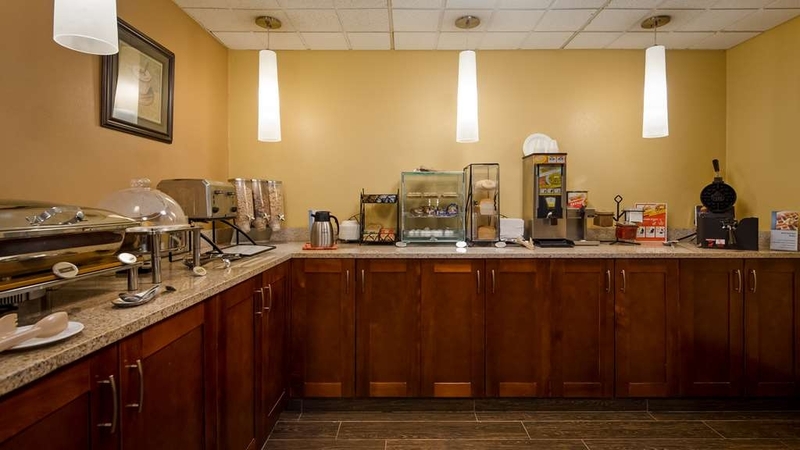 The front desk staff are super helpful and the breakfast room attendant is constantly on the go to maintain the foods available for breakfast. Now the negatives, first of all, the towels are very scratchy. I'd recommend bringing your own, seriously, if you have sensitive skin. The breakfast is adequate but needs a little more variety in the bread/muffin category. How about bagels for a change? After our first day there, they discontinued having water (with lemons) and coffee decanters available by the check-in area. As the weather became more hot and humid, wouldn't it make sense to have beverages readily accessible in the lobby area? We were aware of the lack of an elevator in the building but it could be problematic for someone with a lot of luggage or who is not steady on their feet. The housekeeping was not up to my standards as lint on the floor remained there the entire length of our visit. Thank you for staying with us while you were in Port Clinton. We appreciate your comments both positive and negative. We will use these comments to make our Hotel better for our customers. We hope to see you again. "Four nights in an excellent hotel"
We are glad you enjoyed your stay during Birding week. We have many repeat customers that stay every year. We hope to see you again. Very nice hotel . Walking distance to Lake Erie. The staff was friendly,courteous and knowledgable of the surrounding area. They put us in touch with several landmarks that were very interesting. We would recommend this hotel. We are glad you enjoyed your stay. We hope to see you again. In town on business - had a good four night stay - had no issues with the staff or the facility. Could see lake Erie from my Hotel room window. Many choices to eat that were very close to the Hotel location. My wife and I stay at this hotel about once a month, mainly for the hot tub, but Port Clinton is a nice town, sort of a small town atmosphere. There is a public beach a short distance away. All in all, well worth checking out! The guy who checked me in was very helpful and knowledgeable about rewards program and let me upgrade my room or get a gift bag due to my status! He was also very informative about the surrounding restaurants. Thank you for staying with us in Port Clinton. Best Western has a wonderful Rewards Program. We hope to see you again. "Room Was fine, breakfast was disappointing"
We came to Port Clinton for a quick overnight trip and to check on the local fishing action. My husband has stayed here a few times while ice fishing in Port Clinton and he was happy with his past accommodations. the room was fine, however, we went to breakfast around 8 and the choice of hot items was limited. We did ask if there was anything else that would be available, and the desk attendant stated they were not prepared for the amount of people who stayed this weekend. The location is good and the property seems well maintained/updated. I would probably stay here again as it was comfortable and quiet. Thank you for letting me know about the breakfast. We strive to make sure our guests have a good hot breakfast to start the day. We will use your comments to improve our service. We hope to see you again. "Great find near the water"
I normally stay a little closer to Catawba Island on my trips to the area, but ventured one exit to the west and glad i did. Very well kept hotel, great breakfast and a very good value. This hotel is less than a 1/4 miles from US2 exit and easy to find. Will be my hotel of choice on my next trip. "overbilled for damages beware warning!!! port clinton"
i was billed $200 for a damaged table leg without my consent which resulted in over draft fees through my bank. warning. do not stay there!!! i have stayed there 10 to 15 times and will never go back again the way i was treated by the manager. this is a tourist area and i hope others do not get unfairly overcharged for accidental mishap. charged $200 for a table worth $60 and i didnt even get to keep the table. BEWARE!! We never want to lose a customer's business. However, when our property is damaged as it was in your case the customer is held responsible. It is standard procedure to charge the guest credit card on file. We are sorry for any misunderstanding. There was more damage than just the table. The towel rack was off the wall and the electrical receptacle in the bathroom was also damaged. We visited Port Clinton in early March - when many hotels and restaurants are still closed for the season. As always, our stay at the Best Western was very comfortable and accomodating. The breakfast was very good, the clerks and assistant manager were most helpful and friendly (helping us find the best seafood dining), and the pet friendly room had an entrance both from the inside hallway but also to the parking lot, making puppy potty breaks easier. We are glad you enjoyed your stay in Port Clinton. We hope to see you the next time you are in town. Thank you for staying with us. "Pretty good for an unpleasant trip"
Had to make a trip up for a funeral. The hotel was convenient, the staff friendly, and some small bits of kindness made an unpleasant trip a little better. While I'd probably not stay during the season, For the two trips I've had to make off season (first to visit with a dying relative, and then for her funeral), it was a good value. We are so sorry for the passing of your relative. We are glad we were able to make your trip a little better under the circumstances. Take care. "3 beds for a family of 5... awesome!" We host exchange students and when our family grows from 4 to 5 because of this, we have a difficult time finding hotels that will give us enough bedding without someone being stuck on a sofa sleeper or roll-away bed. The 3 double beds in our room at the Best Western suited our needs for a quick trip to Cedar Point perfectly! The hotel staff was very friendly, the breakfast was fine, although an extra waffle iron to speed things along might have been nice, and the property was very clean and well-kept. A pleasant surprise! We are glad you enjoyed your stay with us. Our rooms with 3 double beds are great for families. We are glad we were able to accommodate you. We hope you will come back again,. called ahead for a room. the clerk was very helpful. Our little dog stayed for free, I appreciate that. I am always sure to pickup my doggy do. This motel has doors in the front and back of the room, felt much safer. Thank you for staying with us in Port Clinton. We hope to see you again. Husband working at unclean power plant for a few months. Fur babies and I travel with him and stay in local hotels. This one exceeded my expectations. Arrived to find room was completely clean from top to bottom, including AC filter. Friendly staff, across the street from Lake Erie. Restaurants are walking distance. Thank you for your compliments. We hope you enjoy your stay with us. Came up to visit with family entering Hospice. The hotel happened to have the better price for what I needed, so it won my business. While not a brand new hotel, it was a very nice hotel. Only real issue I ran in to was the wifi, which for some reason really did not have strong signal in the room. We are glad you enjoyed your stay with us. Thank you for letting me know about the WIFI. A little more pricey than what was shown. Stayed on first floor,very accessible. Close to jet express. Decent breakfast,friendly staff,clean rooms. For the price,would probably try someplace new next time. Thank you for staying with us. Our rates are competitive with other hotels in the area. We hope you will come back again. Nice hotel, comfortable accommodations. Food ok -- need to rotate items and not have the same thing everyday. Handicap access on first floor. Convenient location. Found it quiet although it was on main road. We are glad you enjoyed your stay with us. We hope you will come back and stay with us the next time you are in Port Clinton. We arrived on the day we said we would and were promptly checked in. The manager and staff were very attentive. The room was in good order. We would stay here again as we are planning a return trip next year and maybe stay longer. Thank you for staying with us in Port Clinton, Ohio. We hope to see you again. Stayed for one night after day trip to PIB. About a 2 minute drive from Jet Express. Staff is very friendly and breakfast was good. Double beds had the sheet-wrapped blanket concept which I really like. Room was recently partially updated but found some shortcuts were taken in bathroom (still had original door, wall tile, and older shower insert which was a bit narrow). Towels are thin and could be upgraded. Room air had a slight stale odor. Overall, it served the purpose and we appreciated having a decent place to stay. Thank you for staying with us in Port Clinton, Ohio. We appreciate your comments. We will use them to improve our property. We hope to see you again. 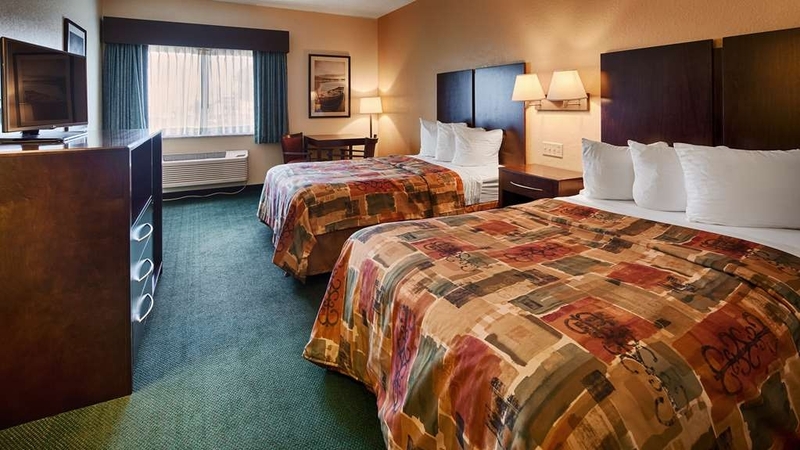 "Quick Getaway to Kelleys Island"
Booked this Best Western for a last-minute trip to Kelleys Island. 2 adults & 2 kids in double beds wasn't the best sleeping arrangement but it was fine for an overnight stay. Room was clean, staff was very friendly and helpful, free breakfast was pretty impressive as far as what was offered. A little pricey ($145) for small room with double beds is about the only complaint I have with this location. They really need to offer some rooms with queen-sized beds!! Although the double bed option is what seems to be the norm at most of the other chain & independent hotels in that area (I checked most of them). Overall not too bad for a last-minute trip to the area. Very nice hotel, friendly staff! Within 5 miles of the Put-In-Bay ferry. Only drawback was there was no elevator and we were on 2nd floor..hard for older people like my mom..I had to carry her luggage, but overall a nice place to stay! "Best Western, Port Clinton, OH"
This hotel was very nice. The rooms were spacious and clean. We had a microwave, refrigerator, safe, ironing board & iron and hair dryer in our room. They serve a hot breakfast. The outside pool was nice also. "Nice - but there was an odor in the room, and a problem with the cooling"
Thank you for staying with us in Port Clinton. We appreciate your comments. We will use them to improve our property. We hope to see you again. My son and I stayed Saturday 8/13 and checked out Sunday 8/14. Our second floor room was great. The beds were pretty good, the pillows were perfect! The air conditioner rocked. It was in the 90's and it kept the room cold. We slept like a rock. The free breakfast was great, Bob Evans sausage gravy was piping hot, eggs and sausage. The gentleman that runs the breakfast does an outstanding job and keeping the breakfast stocked up and hot. Desk staff very friendly and helpful. Thank you to the young lady who checked us in Saturday night. She got us signed up with Best Western reward club, which saved us 10%. We really enjoyed staying, we will be back. As for the pictures posted. We didn't see anything of the sorts. The hotel was spotless in my opinion. Thank you for the wonderful review. We are glad you enjoyed our property. We hope to see you again. The people at this hotel were very inviting and aimed to help make our stay a great one. Very convenient place to stay. Nearby many great locations to visit. Think about a stay yourself. The only drawback was no elevator to second floor. Not a good thing for those who need that. Thank you for staying with us. We appreciate your business and hope to see you again. "Girls Mini Vacation at Put-In-Way"
The hotel and staff (especially Joey) was fabulous. The only concern I have was when making reservations. I was quoted a price online of about $129 per night for three nights (Wednesday, Thursday and Friday) I almost clicked the button to pay immediately but decided to call instead using the 800 number that was clearly listed on the website, thinking it would better to speak to a real person. I was then told by the person on the phone, the cost per night would be actually be $139 for the first two nights and $289 for Friday night!! I thought this was bait and switch but I had already planned this trip with my two friends and really wanted to stay at a Best Western for safety reasons, I reserved only the first two nights and said I would make other plans for Friday. Upon arriving at the hotel, I questioned the staff about this issue. It was discovered I was led to a travel agent by using the 800 number listed on the Best Western Website. The staff advised in the future to call the hotel directly and as a reminder, they do not have a 800 number. My biggest question at this point is why Best Western would allow a Travel Agency to post their 800 number on the Best Western Website. I was really angry after the phone Thankfully the staff explained what happened so I don't blame Best Western for Bait and Switch. Hopefully your company will correct this matter. Thank you for letting me know about the experience with the internet. We will definitely look into this. Yes, it is best to just call the hotel directly 419-734-2274. We hope you enjoyed your Mini-Vacation. Worst hotel we have stayed in on our vacation. The hall door would not shut properly had to slam it shut, the bathroom door would not shut at all, the air conditioner stopped running and the TV faded out to where it was barely visible, smoke came in the air conditioner as folks were smoking outside our room. The staff were friendly enough but the accommodations were terrible. Next time we are in the area, we will find other accommodations. Thank you for letting us know about these issues. This is not typical of our property. We will definitely address these issues with maintenance. One of the best breakfast for variety and quality I've seen. Offered items normally not seen. Breakfast staff and hotel staff were super friendly and professional. Spacious rooms. Great location for seeing the area. Hotel was very accommodating for wedding parties. Went out of their way to make sure a large group was satisfied. Great Manager who was very attentive to our questions, any provided help in making sure everyone's stay was satisfactory. Thank you! A thee nigh stay in Best Western in Port, Clinton, Ohio. Good location not right in town. Staff was very helpful with local resources. Free internet and an adequate self serve hot breakfast were helpful. Bed was comfortable. Had stayed here before a few years back and to my surprise they must have remodeled. Room was very nice and at a great price compared to other competitors I have stayed at in this area. Would definitely stay again. "We wanted a place close to the miller ferry line for a trip over to put in bay. this was a perfect location." This was a nice clean hotel. Good parking. check in staff was polite and, helpful. We had a king bed which was comfortable. we did not use the pool area. The breakfast area was clean with good choices for a simple breakfast. "Great family hotel in Port Clinton"
Great value for a comfortable and convenient place to stay when you're visiting Erie up at Port Clinton and/or the Marblehead Lighthouse (and the WWII aviation history museum). Stayed with family and got a room with 3 double beds! And the breakfast is a full breakfast with waffles, eggs, sausage, biscuits, oatmeal, toast and muffins, yogurt, fruit, juice, and coffee! And it's included in the price of the hotel stay! Hotel has a pool and is surrounded by places to eat and across the street from the lake (great beach park about less than a mile down the road). Very reasonable! Clean! Not luxurious but for those traveling with kids and family, a great find! I recommend it for families with kids. You are near the Safari Park and much more. 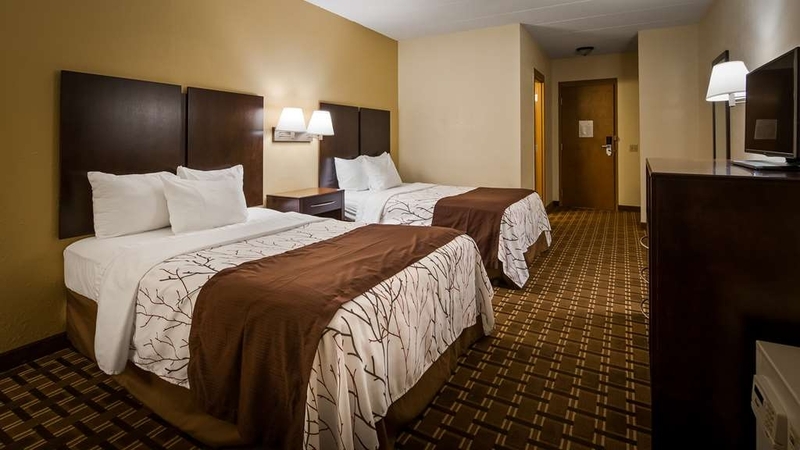 "Good value, very clean room"
Overall, the cleanliness of the room was above what we have seen at other hotels. Room was spacious and quiet. Outdoor pool was tiny. Staff was very helpful and caring. The dining area and hotel computer area felt like they were crammed into a space not originally made for those purposes, as they were high-traffic areas. Overall, for the price, it was a good value. An indoor heated pool would give this hotel a much needed activity for evening use. Horrible stay. I paid $227 for a room full of bugs, used shampoo, next to a loud maintenance closet and woken up at 5am from pounding. If I'm paying that much money I expect them to at least sweep the dead bugs out of the the parking lot. The staff was nice. The breakfast was ok.
"over priced,needs updates,smelly rooms,many mayflies outside"
I go up to Port Clinton every year for the National Matches held at Camp Perry, so I am very familiar with this place. They are not very friendly at the front desk, the Manager could use some customer service lessons, but the rooms are reasonable and some have been redone. I stay here out of necessity, weekend rates almost double, so I dont recommend staying over Friday and Saturday night, but all of the other motels do the same thing, put a little with it and get a better room down the street if the weekend is in your plans. This hotel was clean and quiet. The bed was decent and it was close to everything we were planning on doing at Lake Erie. The coffee left a lot to be desired and the wash clothes and towels were very exfoliating. The staff was all very nice and helpful. We would stay again!!! "Nice place. Good location. Very Nice and helpful staff!" We stayed here for just one night. Price was fair, but could have been a little less. Place was very clean. Rooms were nice, However, if you stay in one of the rooms in the back, railroad can be heard. Overall, I'd recommend it! Had a King room booked to celebrate my wife's birthday. Needless to say how important that kind of room was. When ee arrived at the hotel to check in we were not greeted in a friendly manner and when we went up to our room we got a big surprise: 2 queen beds when I clearly booked a King room. What's wrong with the reservation I thought? When I went down to check, lady at the desk said: "we ran out of King and had to change you to another kind of room". You should NEVER do that! We walked away and went to look for another hotel. "Very nice and right on the shores of Lake Erie!" The staff here is so very friendly and it is a very nice and VERY clean hotel. When I initially booked it I was apprehensive because it looked dated and had an outdoor pool. Many places don't have outdoor pools anymore. However this was such a beautiful hotel it exceeded my expectations! Breakfast was great too! Highly recommended for this area. Thank you for staying with us in Port Clinton, Ohio. We are glad you enjoyed your stay. We hope to see you the next time you are in Port Clinton. Hope you have a great Summer. I stay at Best Western's every week. This one is my lowest rated, due the facility and room condition. It's been updated with decent beds and bath rooms. The negative was worn couch, poor internet connect, no fitness room, TV reception sucked, and cleanliness of the facility. Hope this helps you make your decision. Thank you for staying with us in Port Clinton. We appreciate your comments regarding your stay. We will certainly use your comments to improve our Hotel. We hope you will come back again. Enjoy your summer. Very helpful staff, good price, and great breakfast. There was eggs, sausage, waffles,cereal, toast, milk, juice and coffee for breakfast with more I can't remember.we were booked to stay at a different hotel but that hotel was a mess. I was so pleased with this staff and hotel. It was clean and quiet. I definitely would recommend it to all my friends. Very good hotel. Couple of blocks from jet express ferry. Very good beach 2 blocks from hotel. Breakfast is good. Front desk representative Joe was very helpful. Everything is well as expected.Good stay. "Rest of management team made up for terrible evening experience with evening manager"
I want to start by saying we are Diamond members with Best Western. All this means is we earn some extra points, but also that we are allowed a free room upgrade, when they are available. So if we book a double bed room or a queen room and a king is available, we're allowed to get it. It may or may not work on Hot Tub rooms, but that's neither here nor there. So we made a reservation at midnight seeing there were a few hot tub rooms available, some double rooms, triple rooms, and a couple queen rooms. Since it's so late we know they aren't booked out because the website shows us what's available. In that case we book the cheapest room and then opt for the free room upgrade we earn from our Diamond status. We get there and there is a lovely young lady who just started working and was one of her first unattended shifts at night. So she had not a clue how to do the Diamond membership and called for help. Totally cool, I'm a former trainer for Pizza Hut and understand so we have no problem with this process at all. She's not able to figure it out and the night manager comes over. Apparently he lives close by or something. I thought it was nice he was so close to support the new team member. Unfortunately, the guy was not going to make our 2am check in go any smoother. His name was Brian. The associate's name that was there who was kind and awesome I unfortunately forgot to get. After talking to the girl for a while and sort of saying do this, do that, don't do this, I get told it's going to be 116 dollars. I said what? I am a diamond member. I paid 70 bucks for my room, and I just want a free upgrade from my status if it's available. He says that's the 'only king bed available" I say what about a queen? It's two am, we're a couple, if you have a queen or king that's all we want. He says there's nothing else (there is according to the site and his two bosses tell me the next morning) and it's just the hot tub room. I say forget it, just give me our original booking and that's fine. Keep in mind it's 2am, I get handed the paperwork to sign, I sign it, pass it back . The girl says what room are we giving them, he says 122. She says isn't that the..and she was waved off, told to not worry about it, and then we were given keys. Upon entering the room, it's the hot tub room. What? We start unloading our stuff thinking he just was being nice, and then I thought for a while and wasn't so sure. So I told my gf to wait and stop unpacking and walked down to the front desk. Im like, sooo, weren't we supposed to be in the double bed room like originally booked? He smiles and says, "Oh, you really wanted that? I asked, did you charge us? He said yes. I replied, well I told you we didn't want to pay extra and were only trying to use our status upgrade, then told you to give us our original booking, so yes I don't want to be charged for a more expensive room and I'd like to get what I told you I wanted. I then had the room swapped and was told "When you come back and return the keys, then we'll give you the keys to your new room". Now im a little annoyed because this is just overboard. I could have been asked to drop the keys off after we swap out. Holding it ransom like we're trying to screw him over because of HIS mistake was a little frustrating. I went back to the room, removed our stuff from fridge and freezer and put our stuff back in our luggage and brought him his key, telling him here's your precious key. He then gives us our new keys and we go to our room. The room is clean, no issues at all. It's all a little "damp" but best I can tell it's because we're on the coast so not an issue. Thats just the climate. The next morning we wake up and talk to the manager and assistant manager who listened and apologized. They were very understanding and assured us they would talk to him and would probably toss some extra rewards points out way. I was impressed with the concern and willingness to hear us out in the morning since the story she was told was we were only upset because we didn't get a free upgrade. " Not everyone just wants something for free, some of us just want to what we were offered, when available, and not a big deal at all if not. The attitude of the assistant and top manager were so much better than I experienced the night before and is the main reason we still rated a 4*. I do not advise anyone to deal with Brian. He's not a very good person to deal with. I have stayed in this Best Western before, and I may stay again in the future. It was quite clean, and is in a great location. Good food is nearby, and it is convenient to stores and all the wonderful birding sites. The staff members are helpful and pleasant. It's been a few years since I have visited Ohio for bird migration, and now that the rest of the world has discovered it, all the hotel prices have gone up for the week. They used to give us discounts! The most recent reviews of this hotel show disagreement on the quality of the hotel's beds. There's a reason for that. I think the hotel is renovating its rooms, which is needed. Some of my friends stayed in a room with 3 double beds. These beds were newer, and very comfortable. The room I stayed in for a few nights had an older bed, which was not so comfortable. All the pillows should be replaced. Period. The breakfast leaves a lot to be desired. I'm not a big critic of a hotel's breakfast if it is fresh, and the supply is good. But, I have to say the biscuits and gravy were inedible. The biscuits were so stale they crumbled if we tried to slice them. The sausage gravy was equally bad. I hate to waste food, but I threw it away. My friends and I relied on the waffles from then on. A couple mornings they ran out of yogurt and fruit. If the hotel improves the beds, I will stay here again. 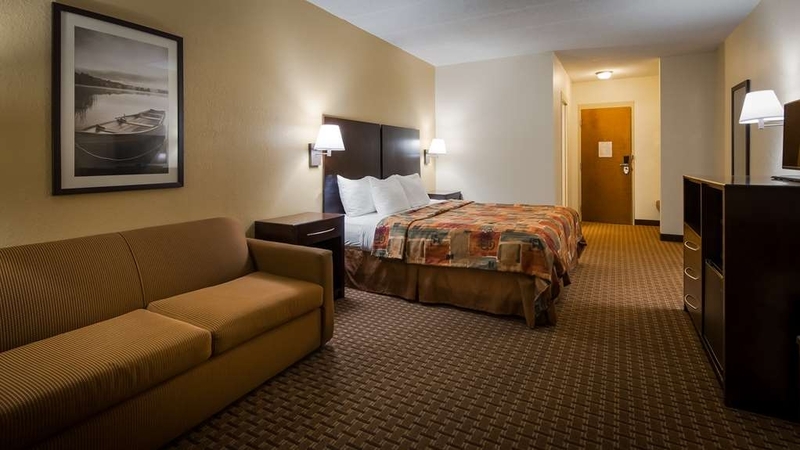 "Best Western Port Clointon, Ohio is a Great Choice"
If you are traveling to the resort area of Lake Erie/Northern Ohio, the Best Western at Port Clinton is a great choice. It is centrally located, a good value for the money, comfortable, with a helpful staff. Also, wonderful beds--no sciatica for 3 nights! There for Magee Marsh Spring Bird Migration. Rates jacked up for the "Biggest Week" event. Needs refurbishing: mattress lumpy, halls shabby, TV small and picture fuzzy. Generally clean and pleasant. Much night train noise in rear rooms. No elevator if staying on second floor. Convenient to Jolly Roger Fish Shop, avoid Bob's Big Boy. We are very sorry you were disappointed in our Hotel. We want all our guests to have a pleasant stay. Our rates are competitive with other Hotels in the area. We certainly welcome your comments and will take them into consideration. We are always looking for ways to improve our Hotel. Thank you for commenting. We're not big chain hotel people, but this BW was well-located, the staff was pleasant and professional, and the room was simple, clean and comfortable. That's a lot of value for the price tag. We would highly recommend this BW to anyone visiting Port Clinton, and we would definitely stay there again. We are glad you enjoyed your stay with us. It is our goal for every guest to have a pleasant stay. We appreciate your comments and look forward to seeing you again. "Great location and nice renovations"
I made these reservations through Priceline so I wasn't exactly sure what to expect with the hotel. But I was pleasantly surprised when we got here. It has been recently renovated and the rooms are really nice, clean and comfortable. Breakfast was good - eggs, biscuits and gravy, sausage, waffles, yogurt, muffins, etc. We had trouble with the Wi-Fi dropping the connection but everything else was great. Picture is the view from our room - 216. Thank you for staying with us in Port Clinton. We are glad you enjoyed your stay. We have recently purchased new furniture for all our guest rooms. We are glad you also enjoyed the breakfast. We have recently added new items to our Hot Breakfast. Thank you for letting us know about the WIFI. We will certainly look into it and make sure everything is working properly. We hope to see you again. Clean, comfortable. Friendly staff. I would not recommend the breakfast unless you like cereal but the coffee is excellent. Would stay again. Rooms were very clean & beds were comfortable. Internet worked fast & smooth without any issues or lagging. Thank you for staying with us in Port Clinton. We have added new items to our breakfast in the last few months. We are always open to suggestions to improve our breakfast. We hope to see you again. hotel smells of smoke poor food . you advertise no smoking . but people smoke in there rooms . why should i have to pay for a room that smells like smoke. ?the breakfast is cold and some food is very old like the eggs in the carton . Thank you for staying with us in Port Clinton. We appreciate your comments. A few years a go we did convert to a non-smoking hotel. If anyone violates our non-smoking policy they are again informed of our policy. I do not know the specifics when you stayed with us. Hopefully the desk was informed at the time. We also appreciate you letting us know about the breakfast. I have informed my staff of your comments. We certainly appreciate you taking the time to write. It is our goal to use comments and suggestions to improve our property. We have not stayed at a Best Western for years. This was a very nice place to stay and they are pet friendly. The room was accessible from outside as well as through the hotel. That is very convenient when traveling with a pet-not having to go through the hotel lobby every time you take your pet outside. The room was very nice-clean and comfortable. The staff was very friendly and helpful. Breakfast was nice. The rate was very reasonable for a holiday. We are glad you enjoyed your stay with us. We hope to see you again the next time you are in Port Clinton. Best Western in Port Clinton was a nice place to stay. Near Lake Erie. Lots of places to eat near by. Rooms were nice and clean. Hotel was easy to find. Friendly staff. No issues. Easy check-in process and easy check-out process. Thank you for staying with us in Port Clinton. We are glad you enjoyed your stay. 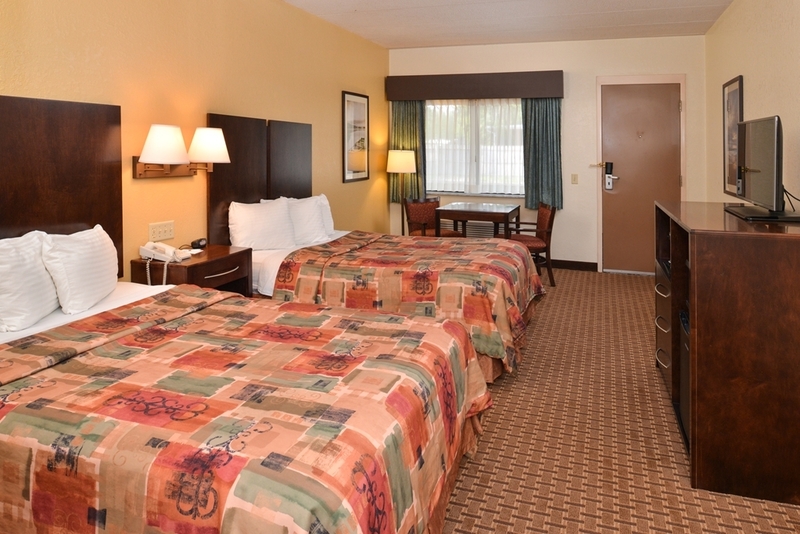 We are conveniently located to many attractions nearby. We hope to see you again. Stayed at this facility on both the 26th and 29th of March 2016. During the first stay when the hotel was fully booked the service could not have been better. The second stay was a complete disappointment. The hotel was not nearly full and the service at both breakfast and checkout was lacking . That is not really accurate-it stunk!! It was a nice room, nice place, convenient to fishing just a really bad breakfast . It was clean and everything was in working order. Staff was friendly. Would stay again and have breakfast somewhere else. "Port Clinton Best Western Stay"
The hotel is a little run down but not terrible. The 2 start rating is low for this place. The staff was excellent. The rooms were OK, but they were clean. It was a standard hotel breakfast but that should be no surprise. We ate in other breakfast restaurants which we had planned to do. Location to the lake and local food and bars was good. Overall a good time, good place to stay and I would go back. If for nothing else the staff couldn't have been more helpful and enjoyable. We welcome your comments and suggestions. In the last year we have added granite countertops to our bathrooms. Replaced carpeting in rooms. And, last winter we installed new furniture in all guest rooms. We are glad you enjoyed your stay and hope to see you again. "Best Western Won't Fix Expedia (HotelsOne) Screw Up"
I made a reservation for 2 rooms back in November 2015. Didn't pay much attention to the receipt being from HotelsOne. We arrived on 2/27/16 and were given Room 111 which was very very small with a king sized bed. Our friends arrived and were given Room 101 which was the taj mahal compared to our room (table and chairs, couch, and lots of space with their king sized bed. Room 111 can only be accessed by the outside door whereas Room 101 could be accessed from either the hallway inside the hotel or the outside door. We are not much for outside doors anyway much less this tiny hotel room that cost just as much as the other very large room. I went to the front desk to inquire why our room was so small and our friends room was so nice and large. The front desk clerk told me they could not do anything because it was an Expedia reservation. Best Western at 1734 Perry St. in Port Clinton, Ohio gets the bad press on this one - not Expedia (sure they don't care.) I would never recommend this hotel to anyone because they were not willing to move us to another room or make this right in any way. Absolutely horrible customer service. I have also told Expedia that I will make sure I do not reserve a hotel from them or Hotelsone in the future. The bathroom floor was freezing cold too even with the heat on at 74 degrees in this tiny room. Was so glad to get out of there this morning. So much for being a Best Western Rewards member. Cutting that card up today. Thank you for posting on Trip Advisor. I checked you out on Sunday morning. I am sorry you did not say something to me. I apologize that you were put in the smaller King room. We did have a Full house Saturday night, We may have had a room with 2 double beds on the 2nd floor. However, we did not have any Kings available. I am sorry you are not happy with our service. I will be contacting Expedia to give you an adjustment to your bill. Again I apologize. Being used to nicer hotels, I was hesitant to stay in a 2 star, but there was nothing about our stay I disliked. The room was clean & comfortable, breakfast plentiful, wifi, staff friendly, shower warm & good pressure, a good location, right across the street from Lake Erie, and a great price (off season). There was no conditioner or lotion, only shampoo, in the bathroom but I did not check with the front desk to see if they had any. Thank you for staying with us in Port Clinton. We strive everyday to insure our customers have a comfortable stay. We are glad you enjoyed your stay. We appreciate your business. We had forgotten to check out the breakfast. We also had dogs with us and requested a back first floor room for easy access. The room was very clean except for under the bed! They obviously forget to clean under there! There was a lot of misc stuff. Yuck. Many to point it out to them when we checked out but forgot. Great location. Thank you for staying with us in Port Clinton. We are glad we were able to give you a room with back door access. It does make it easier when you have a dog to take outside. Thank you for letting us know about the housekeeping. We certainly want to make sure our guests have a clean room. for the price, this place is great, and very clean and pet friendly. i have a dog, and they have rooms on the first floor with a rear entry to the outside which makes it convenient to let dogs out for restroom. The tv's are all updated and work great. All employees are very inviting and very hard working to make sure everything is perfect. the complementary breakfast is very reasonable with selection, both hot and cold choices. Thank you for staying with us in Port Clinton, Ohio. We are glad you enjoyed your stay and the breakfast. We have added some new items in the last few months. We hope to see you again. Thank you for staying with us in Port Clinton. We are glad you enjoyed your stay. There are things to do in the area in the Off season. We hope to see you again the next time you are in Port Clinton. We appreciate your business. 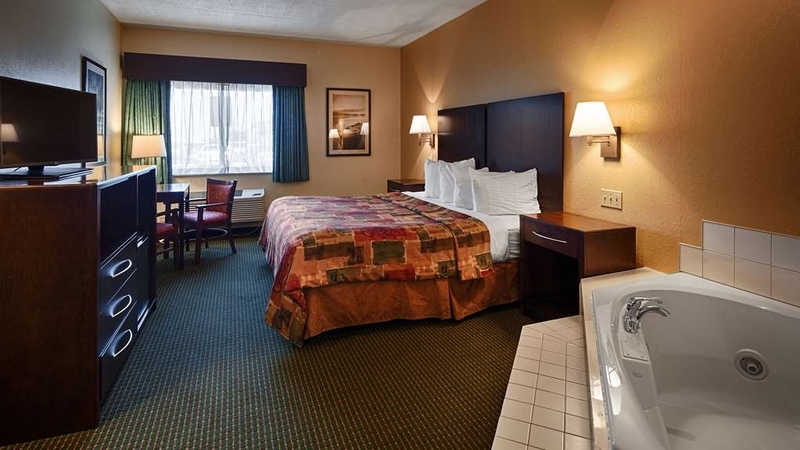 "STAY AT BEST WESTERN PORT CLINTON"
always a warm welcome ,pleasant stay, comfortable including staff. you feel as you belong not just a guest. seems as if entire staff..inc, manager has a very outgoing attitude and is truly concerned for your stay to be the very best it can. property is located very convenient to lake swim beach, downtown area, very good restaurants and winery as well as jet express. only 20 minutes to cedar point. We are glad you enjoyed your stay. As you stated we are close to many activities in the area. There are activities in all seasons in Port Clinton. We appreciate your comments. 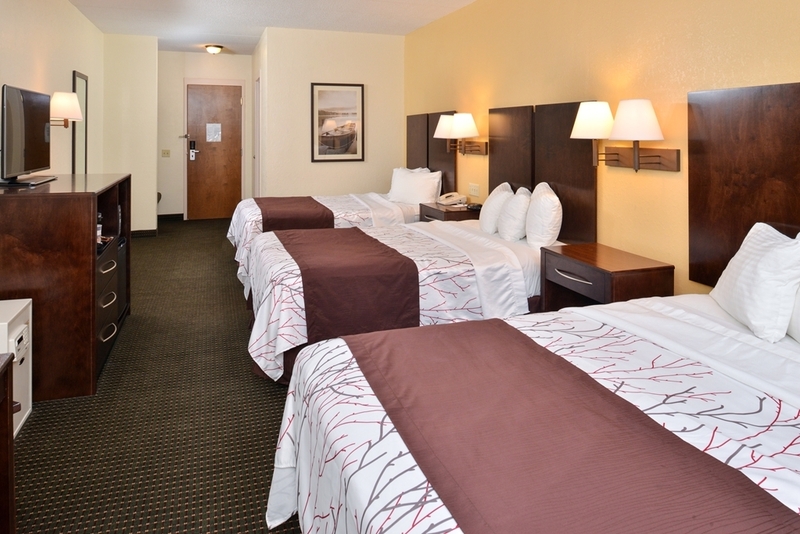 We are always striving to make our guest's stay comfortable. We hope to see you again soon. "Terrific low rate for a good room"
After an awful experience with the La Quinta Inn in Sandusky, we needed a place that was "pet friendly" and came up with this Best Western. Being the winter season it was virtually empty, but was great for what we needed. The room was good, clean and best of all, the rate offered ($60 for the night) was incredible. The staff were friendly and helpful and I would certainly consider staying there again if ever in this area and needing lodging. "Nice Homebase for a weekend around Port Clinton"
Loved having a 1st floor room with a back entrance from the parking lot! This was super convenient for unloading and packing up. Also nice if you have to step outside for a smoke (because it is a non-smoking hotel). The front door opened on the hallway to the lobby which was nice for enjoying the free breakfast, which was basic but enjoyable. The ladies both mornings did a great job keeping things hot and fresh. The room was clean and nicely updated. Used the hotel as home base for a fun weekend around Port Clinton with my sweetie. Didn't travel with the kids this time, but I would feel fine bringing them here. It was a good value for the price. Will definitely stay here again. we love coming to best western in port Clinton ohio. they are so friendly and rooms are always clean and fresh. breakfast bar is a very nice plus and always full and clean. we generally request a hot tube room and for the most part we get one as they have multiples. this property is located in downtown port Clinton and surrounded with restaurants and lounges, only 5 minutes from the finest winery and retail shopping. We appreciate your business. We have recently added new items to our breakfast bar. We hope to see you again. Ok for the price. Non smoking a plus but smokers go outside and smoke travels inside. breakfast just ok. Beds horrible, old and soft. Small outside pool, not heated. Ask for price before committing. just ok.
"Hotel For The Budget Minded, Who Aren't Deep Sleepers"
To be fair, Port Clinton is a resort town and shuts down after October. Our visit was during this time, not much going on. Several businesses and hotels were closed for the season. The Port Clinton BW is a hotel only for the budget minded and short stays. The property is in need of significant repair and updating. Doors creak, carpet/room furniture are old, rust on sink and hardware. Lighting was old and low, switches seemed arbitrary. Beds were average comfort, but small doubles. Not the hotel's fault, but train tracks are near, and about every 45 minutes a whistle would blow through the night, waking me up. If you need uninterrupted sleep, this may be an issue. On the positive side, the staff was excellent and friendly. Parking ample, location good. Breakfast was adequate. Heater / AC unit not too noisy, as is usually the case in older motels. This hotel is a good choice if you want low cost and just a bed to crash. Even so, only the price makes it average instead of poor. IMO, adequate for a night or two but anything longer and I'd consider alternatives. Thank you for your comments. We will use them to improve our property. The furniture in the rooms is new this year. Since you stayed with us we have completed putting new carpeting in the rooms. We appreciate your business and hope to see you again. The room was very clean. The staff was polite. The beds were small and uncomfortable. The bath tub had some cracks in it and could use some repair but overall the room was well worth the $60 we paid. I would stay there again. Thank you for staying with us. We appreciate your business. Thank you for your comments. "Smelly Guest Room with hoards of Mayflies"
Most expensive BW and worst BW stay ever! Heavy Smell of cigarette smoke inside room even though it was a non-smoking room. Several live Mayflies covered walls and furniture. Door lock was only half-way attached so unusable. Breakfast eating area consisted of small tables along the walls in the lobby. "Stayed here while fishing a BASS open on Lake Erie"
I was actually here for three nights in two different rooms. The reason for this is I did not plan ahead. Sure this is a little older property but for the rate and the room I thought it to be an excellent choice. The check in went great and I just wish I would remember or right down the staff names. Anyways he was very good, very friendly and very helpful in getting me the third night in an otherwise booked weekend. He even offered to switch out my belongings from one room to the other. The hotel is right across the street from Lake Erie. Since I was there on business I really couldn't enjoy all the area had to offer. The room was great and spacious. Everything worked flawlessly as it should and I just wished I could have stayed another day. Let me note this. The night staff even made a large pot of coffee for me because I was leaving out very early for the tournament. There were breakfast items in the cooler of the breakfast area for me and my early departure. Who does this? I really think they went above and beyond for one person. Thank you for staying with us during your fishing trip. We appreciate your business. We have many fishermen that stay with us during their tournaments. We look forward to seing you again. "Off Season this place was really ok"
There were very few people here during my 3 night stay in Sept. 2015, but the few i could hear. I was on the 2nd floor and had a view of the water, which is always a treat. room was large, with hd tv, but a bit small, probably 32". Has a re frig. & and microwave.Remodeled rooms but not sure the whole bathroom has been. "Great Value - Clean and kind!" We stayed in this hotel for about $60 and got a great value. 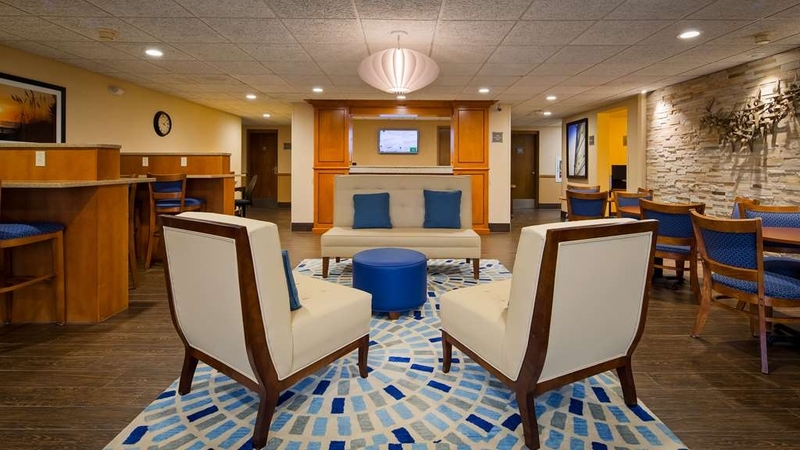 Very clean room and lobby, kind staff, working amenities. It's not a 5 star resort, the wifi was slow, and the decor is a little outdated, but I would definitely stay here again and recommend to anyone looking for a place to stay while they explore all Port Clinton has to offer! "Overnight on vacation road trip"
We stayed here for one night on our way home from an eastern state vacation. We choose this hotel as it just across the street from the lake, and we had a room with a lake view. the check-in clerk directed us to a good seafood restaurant withing walking distance. we would stay here again if in the area. The staff was excellent! Very helpful and good natured. The hotel was in a good location to water and sites within the Port Clinton Area and close to all kinds of restaurants. The pool was clean and well maintained. Interior and exterior doors to all rooms. "Best place to stay for Clinton sightseeing"
We were here for 2 days on our way to Niagara falls, one our trip towards the falls we made a halt here overnight and visited the African safari & Marblehead lighthouse..the rooms are comfy, clean and staff very friendly & helpful..free breakfast..It is located at a great location wherein all the important places of sightseeing are nearby..also the jet express ferry boarding point to put-in-bay is a 5 min drive from here.will definitely comeback for more..good job guys..Kepp rocking!